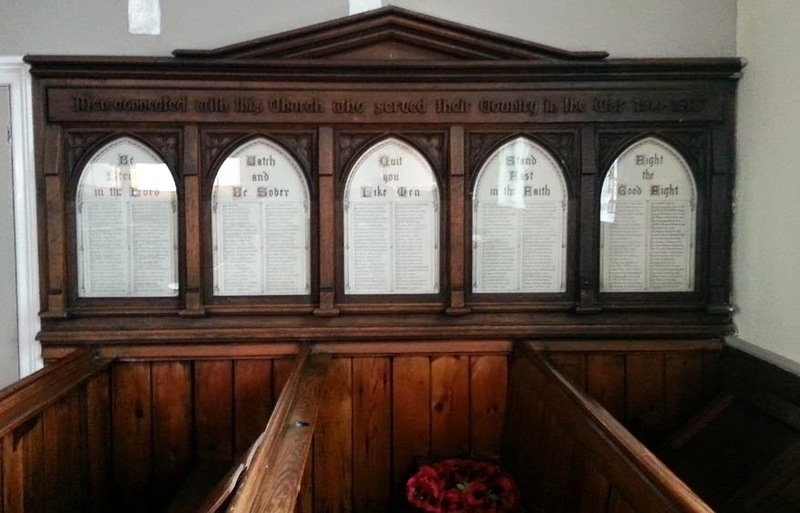 The inscription across the top of the five panels reads, "Men connected with this church who served their Country in the War 1914-1918". The panels are headed, (1) Be Strong in the Lord, (2) Watch and be Sober, (3) Quit you Like Men, (4) Stand Fast in the Faith, (5) Fight the Good Fight. There are approximately 50 names on each panel, arranged in alphabetical order except for the last seven names. Each entry includes the soldier's name, rank and regiment (or ship or service) and medals if any. Fallen men are indicated by the method of their death, eg Killed in Action and have been fully transcribed below. A .pdf file with details for all the men can be downloaded here (thanks to Pete Schofield). In 1917 a stained glass window was unveiled in memory of the soldiers and sailors from the church as part of a matching set of eight windows in memory of the local people including Mr Clough, the recently deceased minister of the church. A Roll of Honour was unveiled at the same ceremony, but that would probably not have been the one shown in the photograph above as it was still only part way through the war. Reference is made in this newspaper article to a plan for a "carved oak memorial of a more imposing character bearing the names of fallen brave men who had gone from that Church and Sunday School." About £95 had been received, and that was estimated to fully cover the cost of the memorials. The money had been given from all classes of people in the township and outside. The first 10s received was from the head of a home which was at one time the most destitute in the township, but where the head of the house was rescued from evil influences by the late Mr Clough.